“Standard” room in double bungalows, luxurious individually furnished deluxe bungalows and a luxury villa in a sprawling 1.6 hectare tropical garden with several lotus ponds and an old, tall trees serve as comfortable places to stay at the Pondok Sari Resort & Spa. 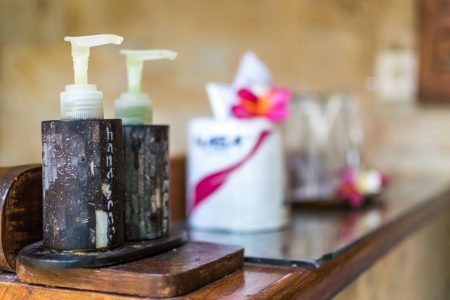 Daily complimentary mineral water is available in all bungalows as a service for all resort guests. If you happen to spend your birthday at the Pondok Sari Resort & Spa, a little surprise is awaiting you on this special day! Indoor and outdoor areas with wooden floor are non smoking areas but each unit have outdoor location for smokers. We use the waste heat from the airconditioning for the production of hot water for the bathroom. Standard rooms, corresponding to the international “Superior” standard regarding size and equipment. All Bungalows are located within a certain distance to each other, each in its own separated area. 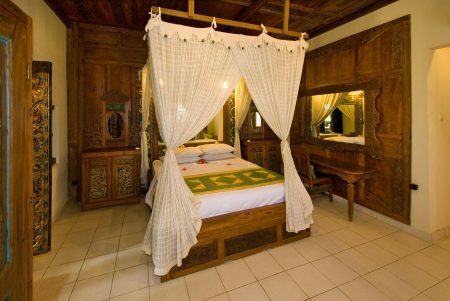 The bedroom furniture is made of bamboo and wood and each bed is covered by a mosquito net – fixed in the gable of the tall grass roof. 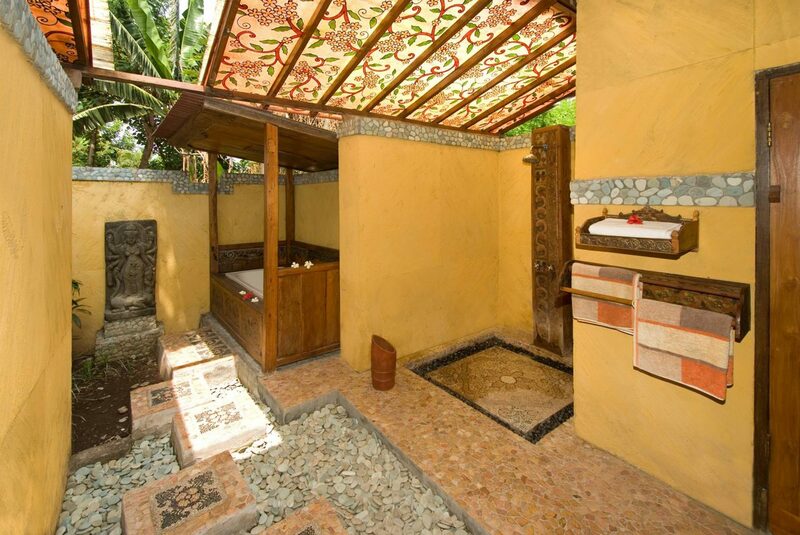 All rooms are provided with air conditioning and hot showers. Some of the “standard” bungalows are additionally equipped with a third sleeping space , to offer enough space as well for families. Baby cots are available on request. The Bathrooms are “Bali style”, very tasteful decorated and semi-open nestled in a small private garden. Double-storey Deluxe Bungalows, which constitute pieces of art due their solitary equipment. All doors, cabinets and chests and complete walls are made from antique wood and have been artfully incorporated. 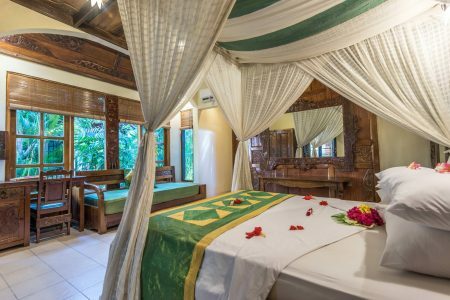 Embedded in the tropical gardens of the Pondok Sari Resort & Spa, you reside in one of the double storey 68 m2 sized Deluxe Bungalows, each luxury built in a traditional village style – a world of its own! Functional comfort blended with antique interior and tastefully decorated will enchant you with an extraordinary ambience. 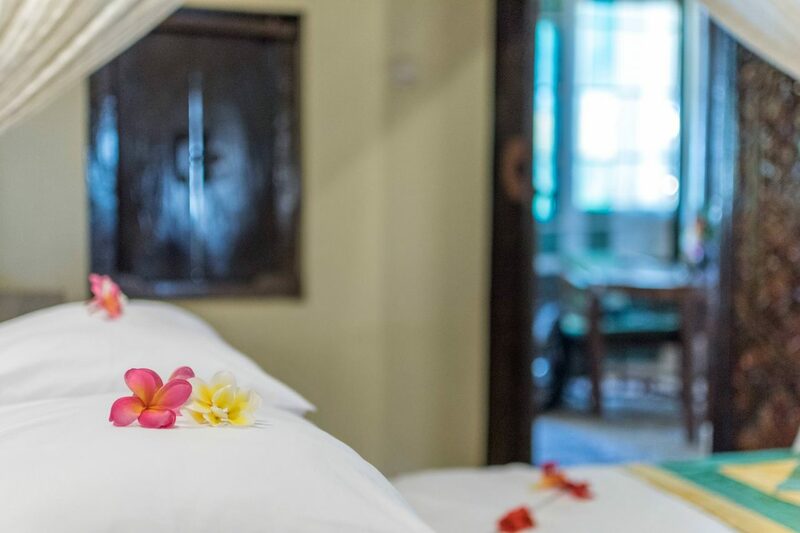 The unique, antique interior of each deluxe bungalow is up to 200 years old and offers a stunning homage to the Javanese wooden handicrafts. The combined living and bedroom with a king-size bed, sitting area and writing desk is air conditioned and include a refrigerator and a safe deposit box as standard. 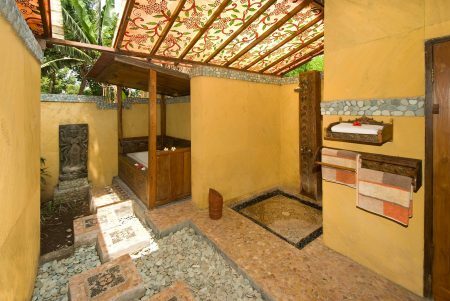 The bathroom, with bathtub and shower, is a dream worked out in carvings, without neglecting the usual comfort of a luxury bathroom. The second floor offers a covered, open air terrace with a wonderful view into the tropical garden. Equipped with an additional ‘day bed’ which can of course also be used at night with mosquito netting and a comfortable sitting area with a ceiling fan, so the terrace can be used in any weather and at any time. Single-storey Family Deluxe Bungalows equipped with additional extra beds offer families with up to 2 children a comfortable place. One bed is placed in the living room, the other in the bedroom which offers a king size bed as master bed. Functional comfort blended with antique interior and tastefully decorated will enchant you with an extraordinary ambience. 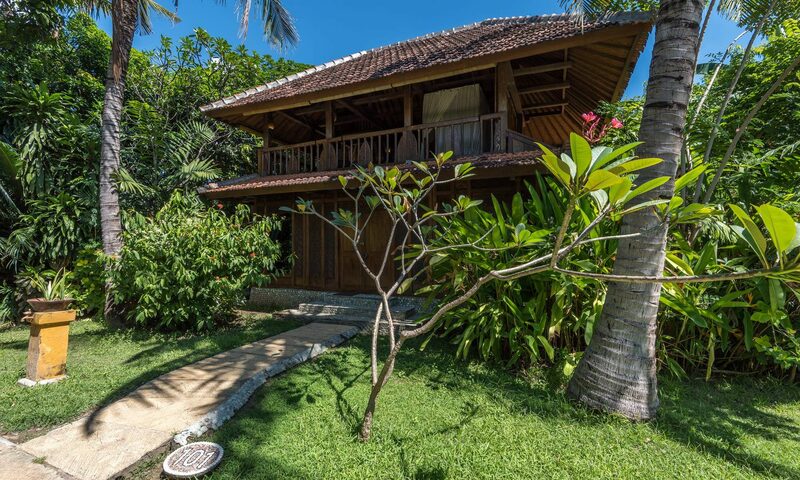 The Family Deluxe Bungalows can be connected by a covered connecting door in the garden. 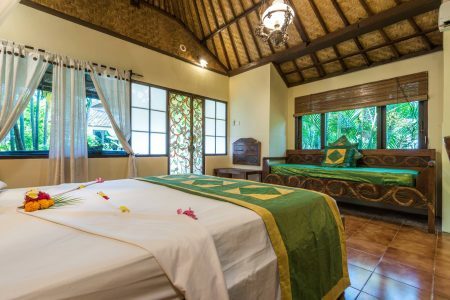 Air conditioning in the room and air conditioning and fan on the terrace, which can be closed – a refrigerator and safety box belong as well to the equipment, and the private garden of the bungalows offer a private gazebo. Deluxe-Villa. 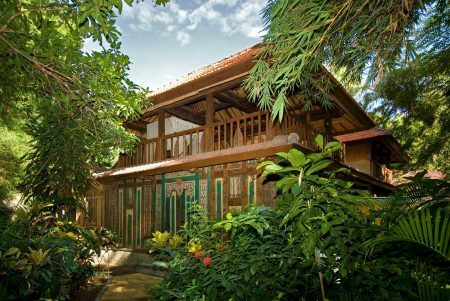 The Villa was built with the same attention to detail as the Deluxe Bungalows, but with an even greater use of antique items and precious woods. A real paradise for up to 6 people! The villa with its 190 sq combines its elegant ambiance with technically high-quality comfort. 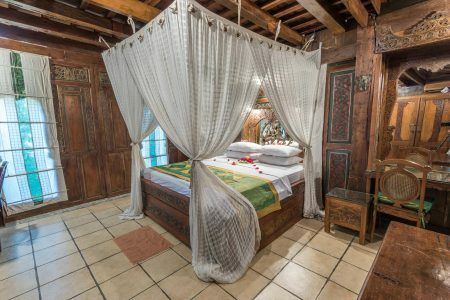 The three individually – designed luxury bedrooms offer each a big ‘feel-good bed’ and ornate cabinets and antique accessories from Java and Bali. Dining- und LivingroomThe spacious dining- and living room is as well very tastefully decorated and creates a comfortable coziness. A CD player with USB connection is available. The seating and reading area and the window at the dining area offer a great view into the tropical garden of the villa. From the pool sofa corner – almost a separate room – you can enjoy the view of the villa’s own lotus pond with integrated SPA-pool (with air- and water-massage) and the garden. From the covered terrace with daybed and sitting area you have a wonderful view over to the mountains surrounding Pemuteran Bay. 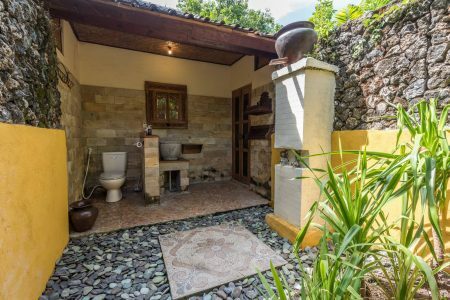 The villa has two bathrooms. The lovingly combination of old wood, mosaics and high-quality technical fittings will impress everyone using the bathroom, be it from the original wooden sink, the fascinating bathtub or various showers – inside as outside – to the functional details, an equipment that will not miss something.